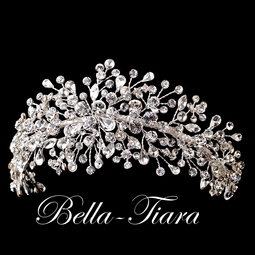 Description: Absolutely beautiful, new to our Royal Collection, Dazzling Swarovski crystal hair vine, headpiece. Bold vines of Swarovski crystals on flexible wire to adjust and style as needed. approx 10" long x 2" wide. with hoops on each end for bobbie pins.